Working on the post “Other Jesus sayings,” which will probably appear in December, I must soon deal with Jesus saying, “A prophet is not without honor except in his own country,” etc. (Mt. 13:57, Mk. 6:4, Lk. 4:24). Those whom I regard as false prophets today are trolls. Many years ago, I recognized that individuals I regard as false prophets are unusually prone to die of cancer. I could provide a long list, but just now there’s no need. I developed a theory of an “irritable personality,” and supposed such a personality might rise from the same genetic bases as a tendency toward cancer. From this article, it appears that I was right. Although it doesn’t give any detailed description of what might constitute a cancer-prone personality, it sets forth that, at least in some persons, the two are definitely linked. Final note: Not all trolls are false prophets, but all false prophets are trolls. All my life, I’ve been fascinated with things that glow in the dark. Where does the light come from? This is now fundamental to my understanding of prayer, and of my vocation. 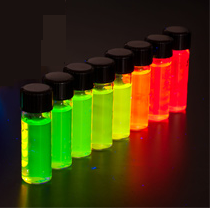 The picture shows what I take for the latest advance in the world of fluorescent materials. Here are germanium nanoparticles in a colorless colloidal (gelatinous) suspension, being irradiated by ultraviolet light. By virtue merely of where they are and what they are, the invisible light that shines on these particles is changed into visible light. The nanoparticles catalyze that process: they do no work of their own, expend no energies of their own, and take no active part in the process; but it won’t occur without them.